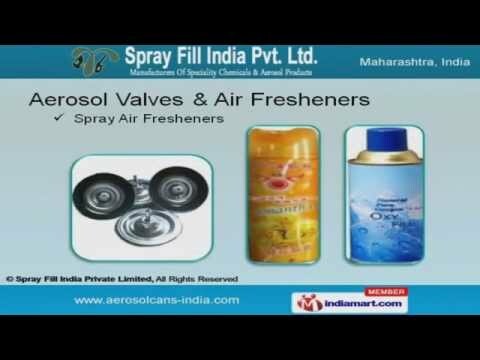 Welcome to Spray Fill India Private Limited, Manufacturer and Supplier of Chemical, Aerosol Products. The company was established in the year 1981 atÂ Mumbai. Our Total quality management helps us to Cater to cosmetics, petroleum and others. Industry leading prices, Stringent quality checks and Faster delivery schedule help us to attain an enviable position in the industry. We offer a vast range of Aerosol Valves, Air Fresheners and Testing Chemicals. Our Empty Cans, Gaseous Fuels and Touch Up Paints are extremely reliable. Aerosol Valves and Air Fresheners offered by us are best in the industry Our Lubricant and Anti Corrosion Sprays are widely acclaimed in the market. We also provide Cleaner and Leak Detection Sprays at industry leading prices. Along with that we offer Testing Chemicals and Welding Products that are a class apart.